This past weekend, as well as the one before it, the L.A. County Registrar-Recorder/County Clerk&apos;s office opened several locations around the city where Angelenos could vote early. The rationale behind opening a half-dozen polling spots to voters early was to give them a chance to vote on a weekend in case they were unable to vote on Election Day. And vote early they did. According to a release by the Registrar-Recorder/County Clerk&apos;s office, approximately 17,718 people voted this past weekend in lieu of waiting all the way until November 8. So many turned out to vote, in fact, that extremely long lines formed at several locations around the county. Though they turned out early to avoid Election Day hassles, many voters ended up waiting several hours in line before they were able to cast their ballot. At the North Hollywood Regional Library, some voters ended up waiting more than four hours before they were able to cast a vote, according to the L.A. Times. In Culver City, hundreds of people had assembled into a long line, snaking all around West Los Angeles College before the polls opened at 8 a.m., according to NBC 4. The polls were officially open from 8 a.m. in the morning, all the way until 4 p.m. in the evening. Anybody who was in line by 4 p.m. was able to vote. "The response to weekend early voting was overwhelming and signals the likelihood of very robust turnout at the polls on Tuesday," said Registrar-Recorder/County Clerk Dean Logan. "While this is positive in many respects, the limitations of our dated voting system and the limited number of locations also show the need to move forward with plans to expand voting options in the future and to offer a more modernized voting experience. Voters who showed up this weekend were enthusiastic and understanding. We thank them for their patience and perseverance." Of course, long lines at early polling locations shouldn&apos;t be all that surprising. 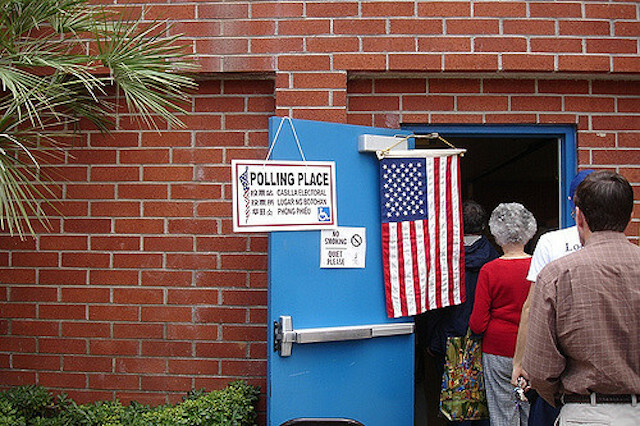 Though County officials invited members of the public to vote at six different locations, there are more than 5.25 million registered voters in Los Angeles County. While the lines are harrowing, they shouldn&apos;t necessarily signal that our democratic infrastructure is broken. If anything, they should signal that there is a very high demand for flexible voting options, and that more money should be allocated to giving people more choice as to when, where and how they vote. Come Election Day, more than 4,500 neighborhood polling places—staffed with volunteers and paid poll-workers—will open up all over the county. County officials told NBC 4 that they expect that the average wait at a poll on Election Day will be limited to 15 minutes max.